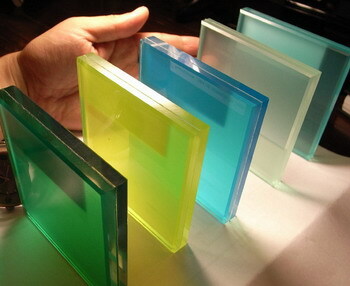 PVB, EVA film is used to be an interlayer film sandwiched in between two pieces of glass. PVB (Polyvinyl buytral) film has been widely used in last 30 years as interlayer in laminated glass for its durability, versatility and ability to protect people and property. However, the strong affinity to moisture makes PVB film difficult to be stored and processed without particular concerns on humidity. Moreover, large investment and high power consumption with the glass processing system has become an entry barrier for people who are interested in this business. Therefore, one step EVA interlayer glass lamination process has emerged as substitution and drawn more and more attention. outstanding cohesion, good temperature withstanding, humidity durability and long-term reliability. One of the major applications of EVA film is as interlayer for making laminated safety and decorative glass. It bonds well with variety of materials (PET film, polycarbonate sheet, rice paper, leaves, etc.). 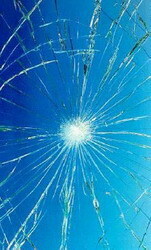 • Effective for prevention of the injury or coming down of the glass caused from a collision. However, you must use EVA film if you are going to make art decoration laminated safety glass with rice paper, photos, wire, metal sheet, etc. because PVB lamination is two steps process and not capable of fulfil such a task. 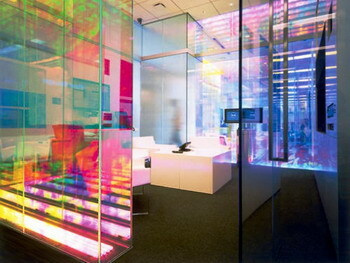 Example: The lamination of lighting LED embedded films between glass may be done with PVB as well as with EVA. However, PVB is laminated mainly in big autoclaves. Consequently 2 - 20 tons of glass are laminated together with standard lamination parameters. In the case of smaller EVA Oven technique, the laminating unit may use optimised parameters without disturbing the standard lamination.